By late morning the delayed start of the race was announced. Now it was another 5 hours to wait. By early evening the dreaded rains came in and the temperatures were cooling. We were all hoping that the rains would let up. As time got closer, there was no break. We knew it would be a cold and rainy start. The only good news we heard was that possibly by 4:00 AM the front might pass through. At 9:30 PM we headed over to the race to drop off our drop bags and figure out the start line-up. To my surprise, with 2300 runners, the drop bag and waiting area was not crazed. In fact, I even found a real indoor bathroom with no line which is usually unheard of in the US. The runners were just relaxing and staying dry. Just before 11:00 PM it was time head out to find the start line and get the race briefing. Outside the rains were not letting up at all. Glad I had my extra clothing in plastic bags. As I got closer to the start line I could see the crowds lining the streets of Chamonix. It was 11:00 PM cold and rainy and everyone was out to watch the start of the UTMB, impressive. I had a difficult time finding a way into the start chute. Race officials were all along the course luckily. I asked one of them where to go, of course they spoke French and I didn't but they understood. They looked at my number, 2606 and checked on the sheet. She said something to me but I understood it as go this way which brought me to the beginning of the start line where I was greeted by another official. She also looked on some sheet and pointed to the front of the line. I was puzzled, this was the very front of the line and there was a press interview going on. I asked her where again and she in broken English said to get in that line. As I ducked under the tape I realized these were the best of the best ultra runners in the world. This was a roped off coral for maybe 50 or so runners. Did they make a mistake? How could some 53 year runner be up here. Maybe I was supposed to go back farther. I worked my way into the back of this first coral trying to hide. I was rubbing elbows and standing with the likes of Scott Jurek, Goef Roes, Hal Koener, Killian Journet. I saw Bryon Powell and moved back to chat with him. The race briefing was underway and of course in French. I figured I would just follow and figure it out as I ran. The rain continued and the crowd was roaring and we were off. Immediately the course was congested with excited runners as we took off through the streets of Chamonix. The pack thinned and I got into the groove of things. It was dark and wet and quickly I warmed up. I had on my new Marmot Mica rain shell for the first time and also a lightweight winter hat along with my usual Mizuno short sleeve tech shirt and shorts. But soon I had to stop to replace my winter hat with a cap to stay cooler. I lost a little time and placement but it really didn’t matter as we had a long way to go and to keep the body better regulated was more important. As I approached the next climb, Croix du Bonhomme, I noticed some stars in the sky and at the same time the rain was diminishing. Very nice, the storm must be ending! Then the climbing started. I thought the first climb was tough but that was just a warm up. There was nothing easy about this climb and as we got higher in elevation I found myself running in snow. And up and up I went, using every available muscle in my legs. And then as equally steep as it was up, down I went on the backside for 3 miles of sheer quad burning downhill. Finally at the bottom I came into Les Chapieux to prepare for the next onset of climbs. This was a major aid station where they also did a special equipment check on the runners to make sure they had their cell phones with them. If not, disqualification would occur. Next up was about 10k of climbing to the Col de la Seigne. What I remember most here was that the sun was starting to show. As the sun was rising the views were exploding with lush green meadows below and tall snow filled mountains above with glaciers all about. After reaching the summit it was back down again and then up again, this time to the Arete du Mont-Fauvre. At this point and throughout the race, I had no idea where I was with place or most times, even where I was. Coming off the Arete du Mont-Fauvre climb, I was cruising along absolutely enjoying some of the best views I had ever seen in my life. It made the foot pain non-existant for the moment and I was overtaken in awe of the landscape. After descending for quite a while I came upon an aid station. I asked the volunteers where we were and they named some aid station. Maybe if I read the brochure I might have recognized it but no, never did. Finally I asked them what country we were in. They said “Italy”. This was the Col Checrouit. They also saw from my race bib and commented that I was from the United States. I said, yes but I’m Italian, my name is “Pilla”. With that, their arms started waiving and making gestures. “He’s Italian, Pilla!” Well, with that, they were serving me food and getting me drinks. We were chatting and I was having the absolute best time with my new Italian family. After feeding me, the cameras came out and we had to do some family photos. One of the women took a picture of my bib so she could email the pictures to me later on. Other racers were going by and I was losing time and placement but figured hanging with my new adopted family was worth every minute of it. Eventually I said I had to go as I had a race to run. I said “Gratsy” and off I went. 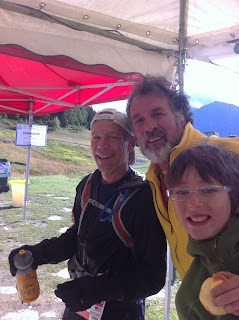 The downhill continued and finally I arrived at the Courmayeur aid station. This was at 78 kilometers and the one and only place for a drop bag. As I ran through, someone handed me my bag and said to run around the corner where I could change, etc. In this busy area, I found a place to sit down and do my thing. First I pulled a dry t-shirt to change into. Dry socks were next with an application of Body Glide on my toes and heels. I also reapplied Body Glide to a number of other areas. For me, Body Glide is a requirement in these longer races. Without it, the chaffing would be just too painful. I had a bag of GU Brew powder to replenish my hand held water bottle. Threw in some more GU gels and replenished the electrolyte pills. I was ready to eat something solid and be off but needed to put the drop bag somewhere else. I asked someone who could speak English and was directed to go up the stairs and around the corner and out the door. Not what I was expecting but as I got up the stairs they had food there. And being in Italy it was a full on pasta spread along with other fine eats. I enjoyed a small plate of zitis with fresh parmesan cheese, some bread and a coke. I never sat down to eat but woofed it down and out the door I went. I never had pasta like that in the middle of the race but I was also not used to eating any of the food or drink they were offering. Not the best to experiment during a race but on the other hand, solid food was necessary to eat now in order to survive the race in its entirety. Next up, another climb. But first we ran through the center of Courmayeur while listening to a band and cheering crowds and then up hill through the streets lined with Italian Villas. Soon we were on single track again and climing big time again, to the Refuge Bertone. This was yet another tough climb but afterwards was a little break with some more gentle hills to get you ready for the Grand Col Ferret. As the midpoint of the race approached this was to be the biggest climb of the day. I thought how much more climbing could it be? Well this was the hardest yet. It was so steep that there were times where you felt like you were going to fall backwards on the way up. And it just never ended. My legs throbbed as I tried to find a slow and easy pace without having to stop to rest. I wanted to stop many times but just kept moving forward. The bad part of many of these climbs is that you can sometimes see other runners in front of you, way, way up there, knowing that you still had a long way to go. Finally after reaching the summit at 2537 meters, it led to some really nice downhill single track for a while. It started off gradually and then increased in steepness. Cruising along I came upon another runner walking on the downhill. Throughout the race I had come upon a number of other runners walking with blown quads. As soon as I got closer I realized it was one of the American runners, Hal Koerner. Hal is one of the top ultra runners in the US and the world. We chatted for a moment. Hal was trying to regroup and would hopefully return to running the race. Hal is one of those runners who I have a deep respect for. Even when he has a bad day, he is determined to finish. It may not look like a good finish time but still, he is one tough dude. And coming up was one of the longest downhill stretches of the course which went on for miles and well over an hour’s time. At some point I had crossed the border and was now in Switzerland. In the valley below I ran through some quaint Swiss villages. 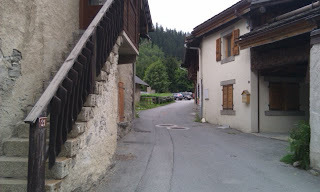 A nice bonus about running through these mountain villages was the frequency of the village stone or wooden water foundations. It was a great way to replenish your fluids just when you needed it most. Next up, another climb, only 1500 meters to Champex. The typical climb which never ended. Always hoping to be there sooner but usually taking longer to get there. At the top was another major aid station. Feeling hungry I was looking for something more substantial to eat as the day light would soon be ended and much energy would be needed to keep going through the night. I was having a hard time with the available foods throughout as I just didn't recognize what it was. For a while chocolate chip cookies where my food of choice then some nice french bread and the pasta was a treat but now was looking for something else. Finally I chose the bread, cheese and salami with some soup. I was a bit nervous about what it might do to the stomach but it did the trick. I found it filled me up enough and gave me some good energy to keep going. After a quick shirt change to get ready for the night I was out the door running through another Swiss mountain village. After looking at the profile map on the wall I figured I had about 20 miles to go to the finish. How wrong I was. From this point the course was re-routed and one might figure due to bad weather it would be shortened. For some reason, the course was lengthened instead and never seemed to end. From Champex instead of climbing some more, the course dropped down steeply to the valley below before another steep uphill climb as darkness was setting in. I think it was after going through Trient on another uphill climb I was running with Stephane from France. We communicated the best we could and commiserated on the climb to the next peak. Part way up we came across a privately held aid station where a nice woman was offering hot tea with sugar. We both looked at each other and figured why not. It was awesome, just what we needed to get up the next stretch. It was quite common in Switzerland along the course to find families offering water and snacks to the runners. From that point it was more of the same, up, up, up in the dark to down, down, down on quad burning trails to the valley below. The night air was cooling but felt good. The energy level was diminishing as time went on. Those last 20 miles turned into more like 30+ miles. By the time I got close to Argentiere, the last aid station, I wanted it over. It was close to 2:00 AM and was told there was another 2 hours to go. As I came through the small village streets I heard some folks yelling my name. It was Oliver and Katie from the Hostel cheering me on with a beer in hand for me. I guess they were celebrating the race and watching my progress. It was great to see and hear them. I refrained from the beer as I really needed to finish this race now. I even skipped the aid station, ran with Oliver and Katie past the hostel and took off. For some reason I was energized and was passing other runners in this last section. I thought the course from here to the finish might follow along the river and be a nice rolling downhill but the course never dropped to that river trail. Instead it decided to climb and climb above Chamonix. Meanwhile I had passed 4 runners in this section and was pushing harder than the entire race. My headlamp was loosing its power and I kept kicking rocks on this rather bony section but still I just kept going. Finally the trail started to descend and of course on and on it went. But soon I approached Chamonix as the course ran through the village streets for quite a while before entering the finish area. It was a great site to see and even though it was 3:30 in the morning, there were many cheering supporters to greet you. Finished!! UTMB is a race I will always remember. The views were spectacular, the runners and crowds were awesome in this foreign country which I had never visited before. For me, I didn't think I had a great race and was dealing with foot issues throughout but in the end, I did my usual and ran my own race. When I crossed the finish line, it was the only time I ever knew what place I was in. When I heard I was the 3rd American and 22nd overall for the race I was really surprised based on the top level athletes from all over the world that were there to race. But it was a tough course with tough conditions and I know I'm way to stubborn to quit so I just keep moving forward the best and fastest I can. One regret I had was missing the awards. Due to my usual lack of communication and reading the brochure I thought the awards began at 5:00 PM. When I arrived at 5:00 PM the awards were finishing up. I heard later that I was one of only two American to actually make the podium. Darcy Africa from the US was third woman overall. And I won my age group which game me a spot on the podium. Thanks to Nick for cheering for me when they called my name! Special thanks to Mizuno for all the great shoes and gear that got me through lots of training miles and through the race. I wore the same Mizuno Ascend 6 shoes for the entire race and only had one minor blister which is amazing based on all the screaming downhill running. For much of the race I was powered by GU Brew and GU gels. When it wasn't available I experimented with other forms of "energy" drinks which varied by country, some good, some not so good. Stay away from that carrot juice somewhere in France. And the Italian "gas" is just seltzer water. Thanks to Gretel for many of these amazing race day pics and Congrats to Gretel and Birger on their outstanding finishes! And thanks to all my training partners, friends and family back home for all the support before, during and after!! !